REMEDY at Duke | REMEDY at Duke is a volunteer program at Duke University organized to recover usable surplus medical supplies and distribute them via Duke-affiliated projects to areas of need overseas. What is REMEDY at Duke? 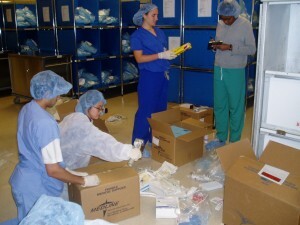 REMEDY at Duke is a volunteer-run program within the Duke University Health System organized to recover usable surplus medical supplies and distribute them via Duke-affiliated and other non-profit global health projects to areas of need. In an effort to improve safety and convenience, the U.S. health care system utilizes a wide array of disposable, “single-use” items. Strict regulatory and risk-management practices, economies of scale, and frequent changes in technology often make it difficult to recycle, re-process or return many usable supplies within our own system. As a result, United States hospitals produce thousands of tons of surplus medical supplies every year, much of it ending up in landfills. Meanwhile, patients in medically under-served communities around the world suffer from the lack of even the most basic medical supplies. We work with Duke Health System administrators and staff to promote environmental sustainability at Duke, while at the same time supporting Duke’s global health and community service missions. REMEDY at Duke is powered by WordPress at Duke WordPress Sites. Please read the Duke Wordpress Policies. Contact the Duke WordPress team.